Apple sold slightly Fewer iPhones in the final three months of 2017 than it did the year before, but higher prices compensated for the dip. The firm reported a record $20bn (£14bn) in quarterly profits, driven by strong growth in Japan and Europe. The results were the first official glimpse of sales figures for Apple's expensive iPhone X. Chief executive Tim Cook said demand for the product, which starts at about $1,000, had surpassed expectations. Quarterly sales at the firm climbed by 13% year-on-year to a record $88.3bn. After an initial fall, Apple shares climbed more than 3% in after-hours trade. Apple released the iPhone X in November, coinciding with the 10th anniversary of the device. And while the overall number of iPhones sold in the period slipped by 1% year-on-year to 77.3 million, the iPhone X had been the top-selling Apple handset every week since its launch, Mr Cook said. 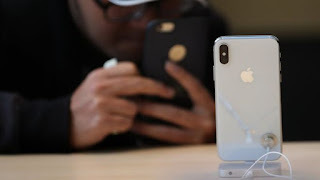 However the tech giant also issued a weaker-than-expected sales forecast for coming months, which appears to reinforce investor concerns that demand for Apple products may be dimming.